If you want to speak fluent English, learn phrasal verbs. What are phrasal verbs? Phrasal verbs are short English phrases ( Verb+Preposition). Those who speak fluent English always use phrasal verbs in their English conversation. In this English speaking practice lesson, you will learn 20 English Phrasal verbs that you could use in your daily Spoken English conversation to speak English fluently and confidently. These English speaking lessons in Hindi are developed by Learnex – A Let’s Talk English speaking Institute company. Learnex offers creative and easy to understand Spoken English lessons so that you could learn English through Hindi, faster and better. 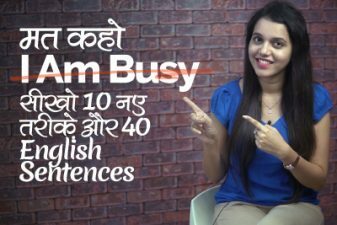 Previous Previous post: Got के 08 अलग मतलब | 60 Spoken English Sentences.